It is the time of year again when summer is (sadly) starting to wrap up, and fall is just around the corner. It is during fall and winter that many people begin to experience cold and dry air in their homes. As the colder temperatures start to settle in, the humidity levels will correspondingly drop. Luckily, having a humidifier in your house can solve this problem! We will be going over that in the article below, and explaining how to use a cool mist humidifier. Where to Place and Use Each Type of Cooling Mist Humidifier? Which Type of Humidifier Should You Choose? Essentially, there are two different types of cool mist humidifiers. These different types include the cooling mist evaporative humidifier and the cool mist ultrasonic humidifier. Each of these models has different pros and cons, so you can learn a little more about the differences and how to use a cool mist model before making a final decision. So, when do you use one? You’ll know when to use a cool mist humidifier because the air in your home will begin to dry up. Evaporative humidifiers are the most common type of cooling mist appliance. They have been used for decades now, and so are quite efficient. The basic principle of the evaporative model is that the water is allowed to naturally evaporate into the room but on a more efficient scale. This type of humidifier has a wick filter, which holds and draws the water up to a fan. The water is then released from the humidifier in the form of fine water mist. This allows moisture back into the room, thereby defeating the destructive dry air. Evaporative humidifiers have filters that catch the scale dust that is produced. This means that you do not need to worry about the greyish dust getting into the room, but it also means that you will need to remember to clean or replace the filters once in a while. The ultrasonic humidifier, on the other hand, is different in that it uses very high-frequency sound vibrations to do the work. The vibrations are what causes the water mist to be produced, which makes it the quieter option between the two humidifiers. Typically, the ultrasonic humidifiers do not have filters attached. This means that you will not need to worry about maintaining the filters. However, without a filter, the mineral scale deposits will make their way into the room in the form of greyish dust. If you are not a fan of this, you can try using demineralized water in the reservoir. 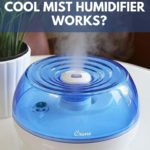 Considering the fairly substantial differences between the two types of cooling mist humidifiers, it would make sense that there is a wide price discrepancy. On average, an evaporative cool mist humidifier will have a lower initial cost. However, there will be an additional cost of filters every time one needs to be replaced. Filters will be a reasonably low cost, seeing as they require replacing fairly frequently. The amount of time needed before changing the filter will depend on how often you use it. For example, if you use your humidifier every day, expect to be changing the filter approximately every two months. An ultrasonic cooling mist humidifier will have a higher upfront cost than an evaporative model. However, there will usually be no extra costs, as there is no need to replace the filter. Due to the fact that there is no filter for this model, maintenance will still be required. This includes cleaning and sanitizing it to ensure that there is no mold or bacteria in the appliance. It is recommended that you completely clean your humidifier once per week especially if you are using it every day. Also be sure to clean it thoroughly if you have not used it for quite a while. For an evaporative humidifier, there will be a little bit more noise when it is operating. Therefore, the best place for this type of humidifier would be in a space where there is a lot going on. This will drown out the sound of the humidifier, and you will not be able to notice it as clearly. The living room or a basement rec room are good options for placing this humidifier. In comparison, the ultrasonic humidifier will operate at a much quieter level. This would be a good choice if you need a humidifier in your bedroom or another quiet room. Having a humidifier in the area where you sleep will be very beneficial, and you will be able to sleep soundly every night. How long should you run the machine? It depends on the model you have, some come with specific instructions on that, but most can run until the water tray is empty, which they should auto shut off. When searching for the perfect cooling mist humidifier, it is important to think about all the considerations that are important to you. If you want a humidifier that is easier to maintain and take care of, the ultrasonic model will probably be best for you. However, keep in mind the mineral scale dust will need to be addressed. If you want to save a bit of money initially, go with the evaporative cool mist model. In this case, you should do a bit of investigating about the best places to buy replacement filters and always try to have one on hand, just in case. In the end, whichever cooling mist humidifier you choose will not make a big difference in the long run. The important thing is that you have a humidifier that is tackling the problems that you are facing in your home. The dry air is no longer attacking your walls and possessions. As well, you will not need to worry about the health detriments associated with dry air. Cooling mist humidifiers will make your house a lot more comfortable, especially throughout the long, cold winters!